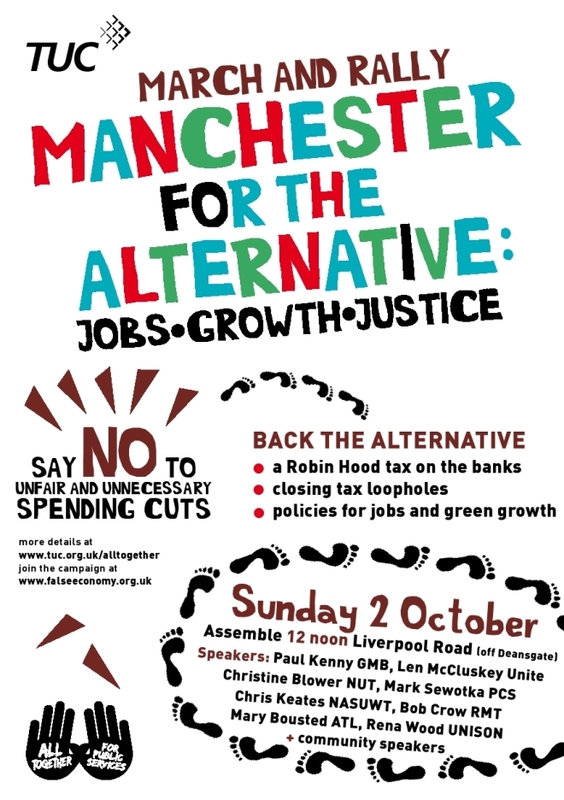 Just a further update/reminder about the National Protest March outside the Conservative Party Conference, Manchester. Final details can be found via the link here, on the Proud to Serve the Public website. The Regional Office has ordered materials (flags, whistles, stickers, wristbands, hats, etc) which will be available to collect at the meeting point on the day. Rallies like these represent a great opportunity to show the Conservative Party and the wider world through the media, that there is real opposition to this Government’s policies. Their economic policies are causing unemployment and real hardship for many, especially the young and those on average incomes, whilst their policies on public services are frankly reckless, and increasingly bizarre. Busy privatising the NHS and overseeing the withdrawal of essential public services by starving local government, this Government has recently announced they’ve found millions to pay for some weekly bin collections! Shows what a twisted set of priorities this government has, when bin frequency tops Sure Start for families or Education Maintenance Allowance. We need to send a loud message, so all welcome – young and old – and please encourage friends and family to attend what promises to be a friendly if noisy rally. And the weather forecast is excellent.